What's a Comic Book Challenge? - a way to figure out "what do I read next?" What makes it a "challenge"? - you don't have to list your reading or even post at all to participate, but what's the fun in that? Want a personal checklist to help you pick stuff to read? Obviously you'll want to edit the below spoilered example checklist to fit your needs. Thanks for the idea David! Cosmic involves a pretty high percentage of books from most companies, so that should make it easy for people to find stuff. And GotG 2 opens early May, so perhaps I'll read a ton of Guardians to prepare. Thanks for accepting the theme! My hope is to make more progress on the Infinity Gauntlet Omnibus, but I have many other titles that qualify, including Guardians of the Galaxy, Dreadstar, etc. Last edited by davidh777; 05-01-17 at 01:36 AM. Here are some past threads for suggestions/background. Guardians of the Galaxy recommendations? I just read Hal Jordan and the Green Lantern Corps' trade titled Sinestro's Law. It's one of the decent Rebirth comics, even as it does end on a cliffhanger of sorts. In addition to continuing the War of Kings omnibus, I went old school with two issues of Marvel Two-in-One from the '70s: The Thing and Captain America and The Thing and the Guardians of the Galaxy. As someone who read a lot of team-up books back in the day, I always liked how they felt they couldn't continue a story in a second issue unless they brought in a new titled guest star. I miss one-and-done stories. I always enjoyed the old Marvel and DC team-up books because they were usually one-and-dones. Finally reading what may be the perfect crossover title for this Challenge, the Star Trek/Legion of Superheroes six issue series from IDW a few years back. Halfway thru and it's just ok, a bit formulaic, as this things tend to be. Last edited by Trevor; 04-15-17 at 08:12 PM. 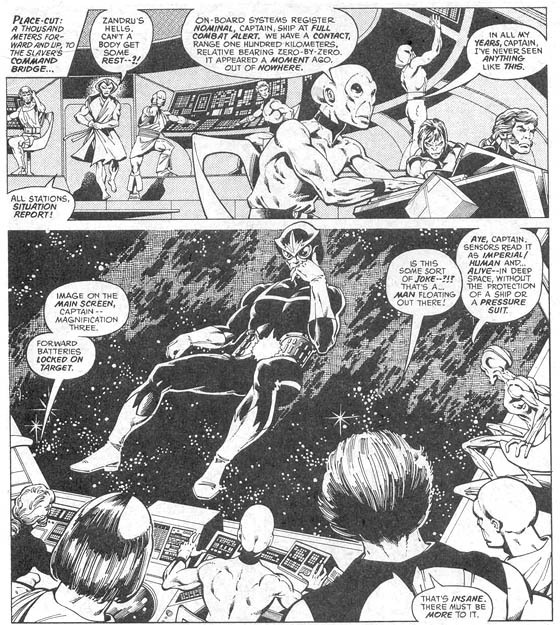 I'm taking advantage of the theme to re-read one of my favorite cosmic stories, Chris Claremont, John Byrne, and Terry Austin's Starlord from 1977. I think I have this story in five different formats: the original Marvel Preview, the colorized special edition reprint, Chris Claremont Visionaries, and the recent Starlord TPB in both physical and digital. It's a grand tale of space-traveling swashbucklers, and the funny thing is that I never read his first appearance (though it'd told in flashback here) or any of the follow-ups until the recent TPB collection. And of course the movie character is based on a later version. I was able to get something in under the wire yesterday! Read Saga, Vol. 7. I did well with this challenge, reading some old favorites and taking a good bite out of my Infinity Gauntlet Omnibus, including much of the main event itself. I like Starlin's writing but miss his art, though Ron Lim is OK.